WESTBROOK — The producer of summer concerts at the Maine State Pier in Portland is working with Rock Row developers to move the shows to the city as early as next spring. 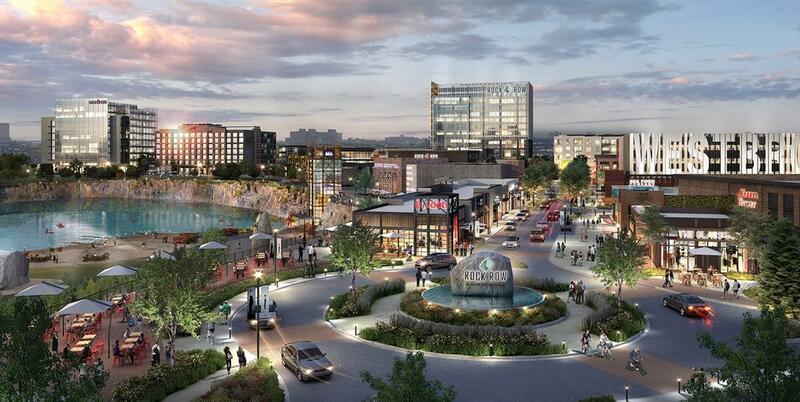 Live Nation is looking to team up with Waterstone Properties Group to bring an 8,000-seat amphitheater to Rock Row, the proposed mixed use development that includes Market Basket on the Westbrook-Portland line. Representatives of Waterstone Properties Group and Live Nation were before the Planning Board Tuesday to unveil their preliminary plans in a workshop session. The plan would be to construct a temporary 8,000-seat concert venue that would be in place for up to five years to give Waterstone Properties Group time “to provide a proof of concept” before deciding whether to make it permanent, said Perkins Thompson attorney Jim Katsiaficas, the project’s legal representative. The venue would be open from late May to September and host up to 30 shows. Live Nation’s Jon Dow said initial concert offerings, which would include a dozen concerts and could take place as early as May 2019, would include all genres of music. Shows, he said, could have some crossover from performances at Darling’s Waterfront Pavilion in Bangor, which he also is involved in. Pavilion performers this summer included Kenny Chesney, Keith Urban, Jason Aldean, Zac Brown Band and Imagine Dragons. Dow said the venue could also be used for local cultural events or beer festivals. If the Westbrook concert venue materializes, Dow said it would mean an end to Live Nation’s involvement in the Maine State Pier concert series, which featured ZZ Top, Dashboard Confessional, Ziggy Marley, The Roots, Halestorm and Dark Star Orchestra this summer. It would not impact the Pavilion in Bangor. Planning Board members reacted favorably to the plan at the workshop, but some concerns about parking, safety and the impact on the neighborhood off Main Street by Cumberland Mills. The venue would be accessed via a roadway off Larrabee Road, with an entrance off Westbrook Arterial for artists and their crews, along with those using the 142-space VIP and handicapped lot. Other parking will be off-site on Saunders Way. Wayne Morrill, an engineer with Jones & Beach Inc., said a lease for 1,687 parking spaces off Saunders Way is being negotiated. Derek Caldwell of Sebago Technics said since Saunders Way is a dead-end street, it would remain open during concerts, but a barriers would be installed to provide a walking path for pedestrians. The crossing from Saunders Way, across Larrabee Road to the concert site, would be well lit and have a police presence. Ensuring that area is safe for both pedestrians and motorists on Larrabee Road is the police department’s primary concern with the plan, said Westbrook Police Capt. Steven Goldberg. Police have proposed closing two of Larrabee Road’s four lanes during events in order to slow traffic and make it easier to manage. Although the developer says only one police officer and private security would be needed for pedestrian/vehicle safety at the crossing, Goldberg said police recommend four officers. The officers, he said, are better trained and have authority that private security doesn’t have. Additional officers would be needed inside the venue. Police Chief Janine Roberts said Westbrook would likely have to rely on mutual aid from nearby police forces, such as Gorham or Windham. Security and safety is Planning Board alternate Kim Fickett’s biggest concern. Planning Board member Rebecca Dillon, who represents the section of the city where the venue is located, asked about the noise impact on Ward 1 neighborhoods. After receiving 130 complaints about Maine State Pier concerts in 2017, sound monitors were installed around the city in August 2017 to capture the noise level during the 2018 season. Waterstone hopes the temporary arrangement can be a permanent addition to the site. “If successful, we would be coming before you to talk about a more permanent location on the site,” Katsiaficas said. If the amphitheatre is permanent, Morrill said, parking would be moved to the site and the parking lease on Saunders Way terminated. Planning Board Vice Chairman Rene Daniel said he hopes the concert venue does become permanent. “I like the project. I am one of the ones who asks the question, ‘why not Westbrook?’ I am excited about the whole theory. I am glad you chose us and I am glad we can work with you,” Daniel said, adding he hopes the developer continues to consult with police, fire and rescue in both Portland and Westbrook as final plans get drafted. Katsiaficas said the hope is to return to the Planning Board with more formal plans next month.